Now that you’ve put your home on the market you may realize that you need to update it to secure a favorable sale. If you’re going to be repainting your home, you may want to consider colors that will make your home distinguished. Choosing colors that are complimentary to the style and design of your home is one way to do this. Although color psychology is not an exact science there are some basic principles that marketing professionals use to improve sales. As a seller you can do the same. All colors are derived from three primary hues: Red, yellow and blue. The way they are mixed and combined results in a vast array of colors, divided into warm and cool tones. And that’s where it can get a bit complicated: Humans are able to perceive millions of different color variations, and subtle differences can result in unique reactions. Although colors can influence a purchase you’re better off sticking with neutral tones as they’ll allow people to add their own color personality. Both on a home’s exterior and inside each room, color plays an important part in attracting — or discouraging — potential buyers, so if you’re thinking of refreshing your home’s color scheme before listing it for sale, it’s wise to study the basics of color psychology. The goal is to appeal to the widest possible pool of buyers. So stick to neutrals. With that being said you can always add color to your home to make it more appealing. So take the time to drive through different neighborhoods and visit open houses. Take note of exterior trim colors that seem especially appealing. Study interiors: Look beyond the furnishings and visualize rooms as they would appear empty. Analyze different color options, and notice that the most appealing homes typically have a unifying theme. That doesn’t mean that every room is the same color, but simply that color choices throughout the home are related and compatible. Take the time to analyze your homes current color scheme and update it or redo it if it’s not appealing to your market. Trying sticking to one underlying tone as this is especially appealing to many buyers. 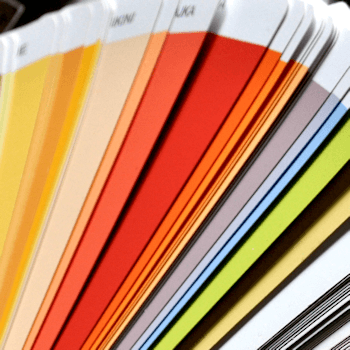 Sticking to similar hues will allow buyers to visualize their own color options for the home. While you don’t want to spend a fortune on repainting your entire home you could still add some flair to it by adding accents of color. For instance if you love energetic red, consider painting your entry door red and adding red accents in some of your rooms. Color is very personal, just like a home. Just remember that when you sell, not everyone has the same personality and tastes as you do. So choose wisely and it will no doubt appeal to others. Pro Tip: Sometimes the colors you currently have are already good enough! If you decide you don’t need to redo everything, consider putting a fresh coat of paint of the same color – you will have to do less coats and it will surprise you how much it can brighten up your home. If you want to go one step further, you can fill in any nicks or dents in you walls beforehand. After sanding he spots to make it smooth, use a paint brush to lightly paint over those sections, this way they will blend in when you put your single coat of paint over the rest of the wall.